It was a rough morning, to say the least. After several days in the bustling city of Gothenburg, struggling to adjust to the time difference and 18+ hours of daylight, we loaded our gear into the Volvo V60 we’d been loaned for the week and made our way 2 hours north to the town of Strömstad. There, we’d take the 45-minute ferry to South Koster Island, part of an archipelago located 10 km off the west coast of Sweden. We got to Strömstad with 30 minutes to spare, which left us completely unprepared for the comedy of errors that ensued. First, we had to stop to ask for directions on where to park for the ferry. After finding the parking lot and unloading our luggage, I realized I couldn’t read the Swedish words on the machine where you have to pay. I eventually tracked down a kindly Swedish man, who told me that you couldn’t park in that lot for more than 24 hours at a time. We were scheduled to be on South Koster for two days. So we loaded everything back into the car, drove all the way around the town (a challenge, considering its many one-way streets), and parked in a different lot. Time was getting tight, so I rushed to the machine to pay. It was broken. Fortunately another kind Swede came by as I was starting to freak out, certain that we’d miss the boat and, as a result, the activities we had scheduled once we arrived. Sensing my urgency, he quickly called the company that managed the parking lot and found out that they were letting people park there for free until the machine was fixed in mid-June. This preface to our story is significant because 1) it gives you an idea of how remarkably gracious and hospitable the Swedish people generally are, and 2) it will help you understand my frazzled-beyond-belief mindset as the ship set sail. I was sweaty, stressed and exhausted from the mixture of sleeplessness and jet lag. Mary wisely gave me my space. But as the ferry made its way past a series of islets whose smooth bedrock was created by volcanic activity and worn down by the Ice Age, the cool wind and gorgeous scenery gradually slowed my pulse, heightened my senses, and reminded me to take time to appreciate the beauty all around me. My paternal lineage can be traced back to similarly rugged islands off the west coast of Scotland, and it seemed as if the further we got from the mainland, the more at home I felt. By the time we stepped off the ferry at Sydkoster (Swedish for South Koster), I was feeling like my old self again, wide-eyed with wonder and ready for our next adventure. 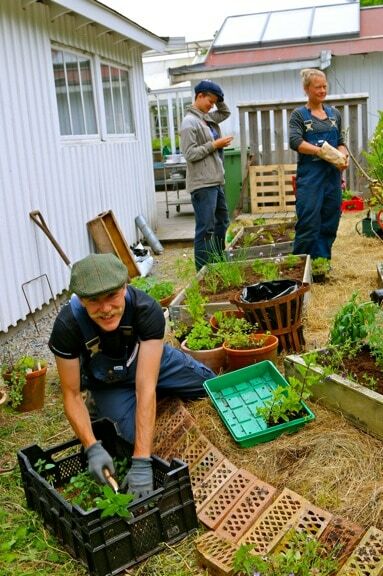 That adventure began immediately, when we met up with Kosters Trädgårdar (Kosters Garden) owner Stefan von Bothmer, rented bicycles from Koster Cykeln, and went on a 3-hour cycling tour of the island. We started with lunch at Stefan’s place, an organic farm built around the concept of permaculture– a philosophy rooted in the idea of working with, rather than against, nature to create a truly symbiotic, sustainable ecosystem. 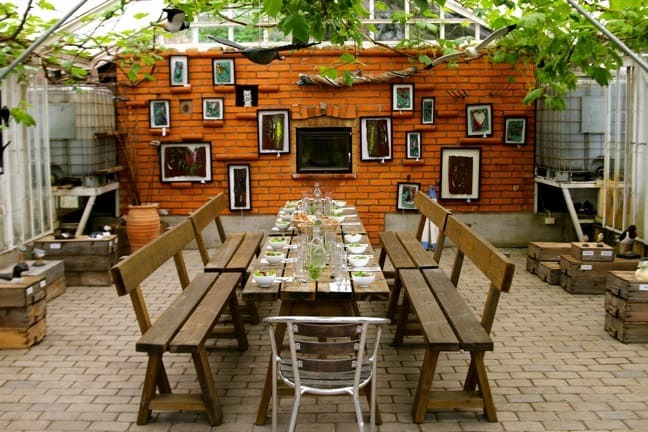 He showed us around the gardens, where he, his wife and a group of young volunteers were planting a variety of vegetables, flowers, herbs and perennials, many of which are used to make the food served in their intimate restaurant. We sat at picnic tables beside their tranquil duck pond and dined on hearty minestrone topped with pesto and homemade cheese, with fresh-baked bread on the side and decadent chocolate brownies for dessert. As we ate, Stefan, a biologist, told us how he and his wife had grown dissatisfied with life in the city 22 years ago and sought a better quality of life that would allow them to pursue their passions. They packed up their infant son and traveled the world for a year, studying sustainable agriculture along the way and winding up in Tasmania. 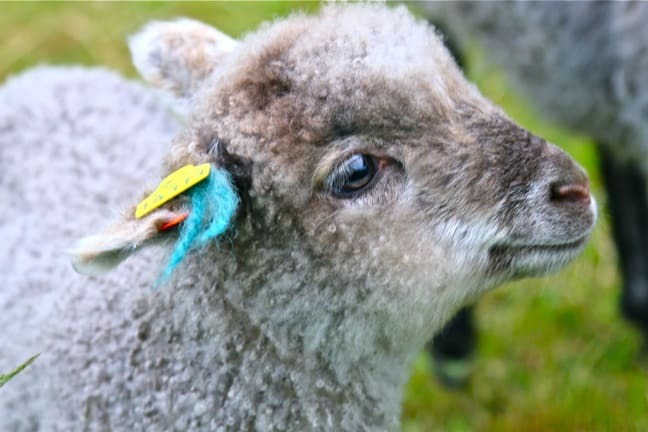 When he called his Swedish father to suggest that they’d found the perfect place on the Australian island, his dad insisted they live closer to home, which ultimately led them to buy farmland on Koster (whose name means “feeding place”). The von Bothmers have created their own little slice of paradise here. 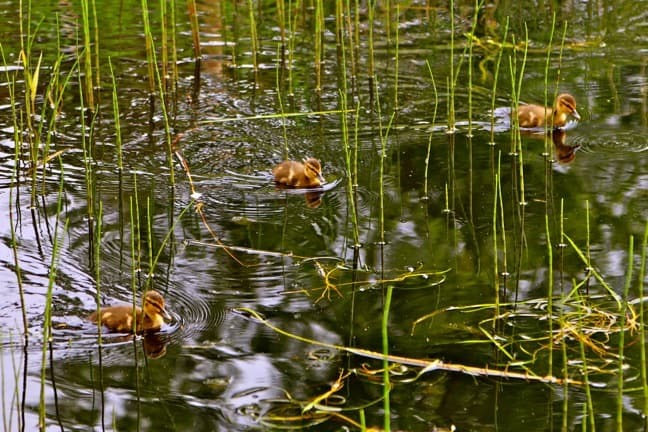 Birds and bees flitter about the flowers, while a dozen ducks swim around the pond. Sheep doze peacefully in the shade of a small pavilion, where Stefan plans to build a stage for the concerts, wine tastings and work conferences they host on occasion. When we visited they were in the process of building a new bar, and a popular Swedish reality show was filming just 15 yards away from us. When he’s not farming or building stuff, Stefan offers guided cycling and kayaking tours of the island on the side. 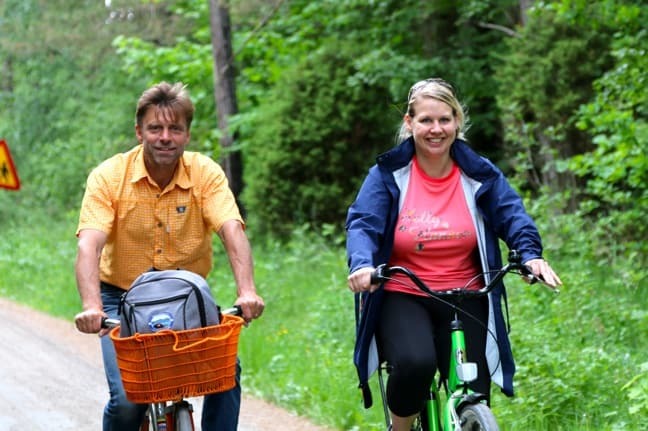 There are no cars allowed on South Koster Island , so biking is really the best way to see the sights. After lunch we set off, beginning with a hike to the top of Valfjäll, South Koster’s highest peak. From here you can see the entirety of the 8-sq km island (pop. 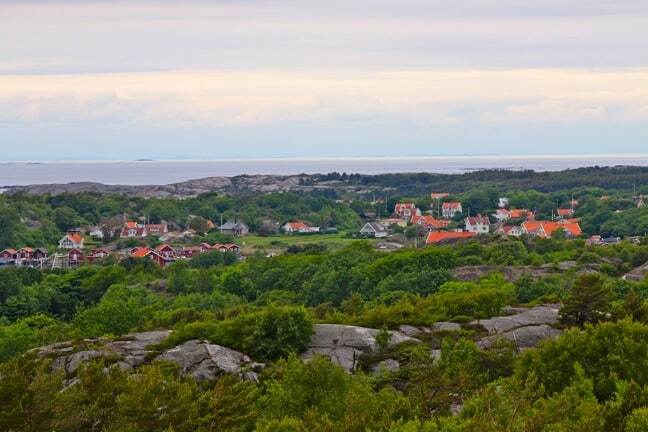 300), as well as North Koster and, in the distance, Norway and Denmark. In addition to the ubiquitous quaint, orange-roofed villages, the area’s most noteworthy landmark is a historic church built in 1939. 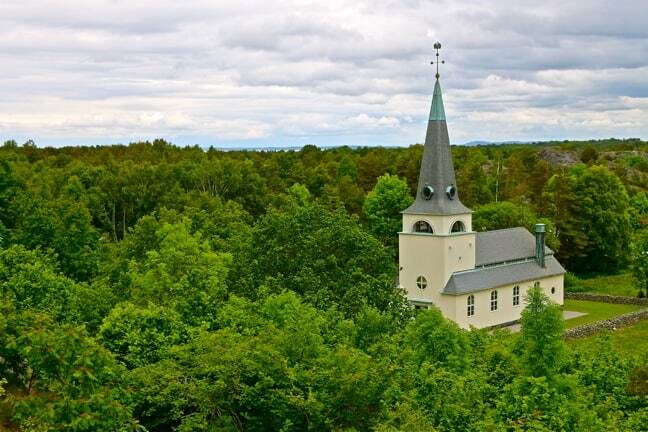 One of only four churches in Sweden to feature a crown atop its cross, this one defines the Koster Islands as the westernmost boundary of the nation’s territory. From here we were afforded spectacular views of the island’s rocky coastlines, and the Koster Fjord. 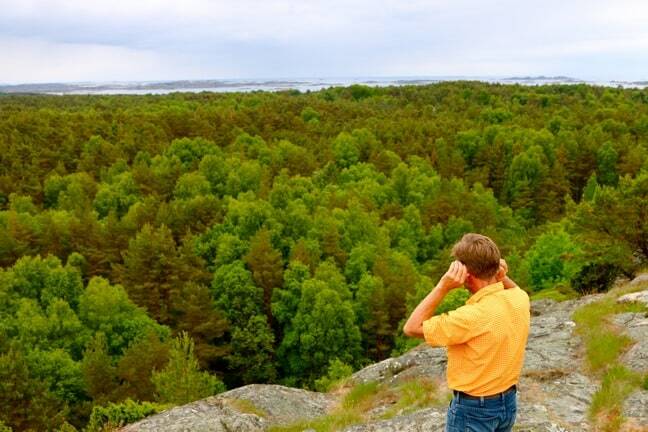 All of the waters surrounding the islands are part of Kosterhavet National Park, which was created in 2009 as Sweden’s first protected marine sanctuary. Thanks to the Norwegian Trench, the waters run more than 200 meters deep just offshore, leading to a remarkably rich marine environment that’s home to over 6000 different species and one of the Atlantic Ocean’s largest cold water coral reefs. Sadly, it was still too chilly for snorkeling. Stefan was clearly in love with this land, encouraging us to take time to appreciate everything from the striking geological formations created by ancient glacial activity to the myriad birdcalls emanating from the lush forests below us. And as we soaked in the tranquility of being the only people exploring this majestic setting, the stress and worries we’d had earlier in the day began to feel like a distant memory. 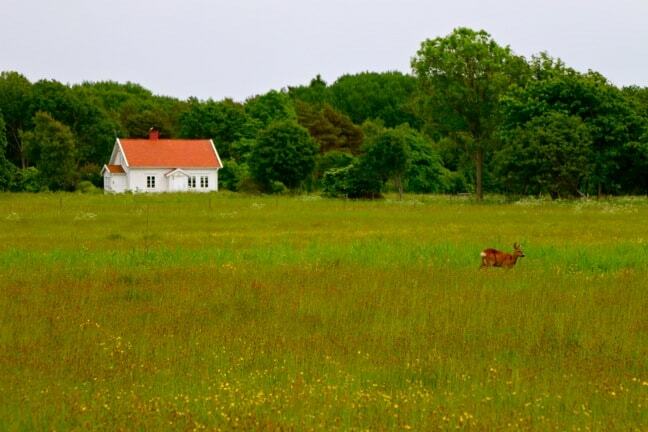 The further into South Koster’s countryside we went, the more deeply we fell in love with it. We passed impossibly green pastures speckled with yellow, purple and white wildflowers that looked like some Impressionist painter’s vision of an idyllic European utopia. While taking photos of one pasture, I noticed two ears poking above the grass, and was startled to see a deer leap to its feet and run away. Apparently she was just as surprised to see us as we were to see her. There were a surprisingly large number of farms for such a small island, with cows, sheep and horses seemingly around every turn. The pastoral setting could not possibly have been more different from the bustling city we’d left behind that morning. 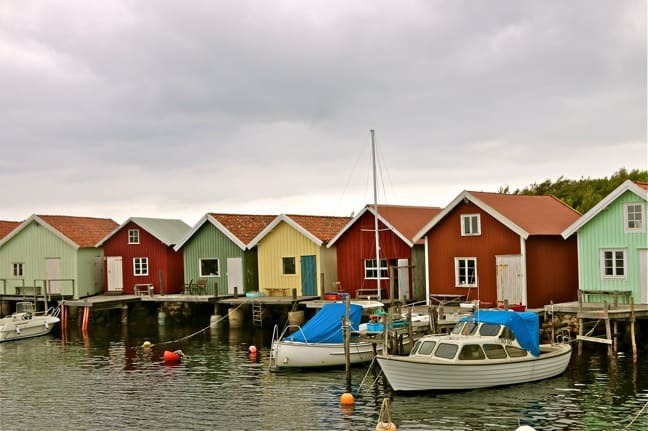 One of our favorite stops along the tour was a tiny fishing village, where a line of boathouses stood in colorful contrast to the increasingly foreboding sky. Fishing boats, crab traps, and an ingenious wooden”lobster hotel” served as a reminder that these people live in harmony with both land and sea, as their ancestors have for hundreds, if not thousands of years. The fish, crab, shrimp, lobster and crayfish found offshore are central to the diet of Koster Island residents and visitors alike, and proved as fresh and delicious as any seafood I’ve tasted anywhere else in the world. 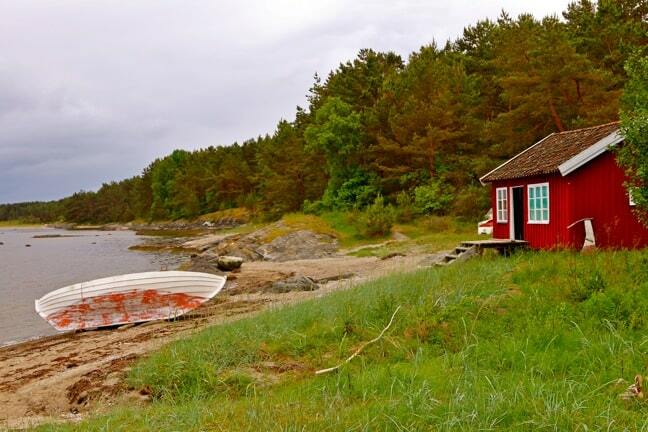 As we reached our final stop, Kilesand Beach (the l0ngest on South Koster), there was a wistful mood in the air. We had bonded quickly with Stefan, who’s also an avid photographer and traveler, instantly recognizing each other as kindred spirits. We knew he had to get back to help finish building the bar, and the light drizzle of rain began to pick up intensity. “I want to show you something,” he said with impassioned urgency, motioning for us to get down on our knees in the sand. He pulled out a rustic leather pouch made from moose ears and handed us each a magnifying lens to hold up to the broken shell fragments that lined the frigid waters. “Look at these amazing colors!” And indeed, it was a kaleidoscope of beauty– a revelatory secret shared by the three of us alone. Our trip was sponsored by the West Sweden Tourist Board and Volvo, but we will never compromise our obligation to our readers. Our opinions remain our own.